The economic growth of the 1990s is largely attributed to the reforms by the Centre. But this is only half the story. For the real credit must go to the phenomenal rise in household savings, including of proprietorship and partnership firms. The customary wisdom of linking growth in the economy to reforms may thus require critical examination, even a revision, says R. Vaidyanathan. THE conventional wisdom is that the increased economic growth in the last 15 years is due to the reform measures initiated in the early 1990s and continued later by various Central governments. Particularly the period after 1992 is considered the “reform era” when the present Prime Minister, Dr Manmohan Singh, was Finance Minister in the then Congress regime of Mr P. V. Narasimha Rao. There is also a sub-text to this, wherein some economists claim that the growth rate has been increasing from the 1980s and, to some extent, the policies of Rajiv Gandhi (post-1984) in opening up the economy are cited as the reason. There is no doubt that the economy saw a higher growth rate in the 1990s compared to the 1960s and the 1970s. This growth rate is essentially due to the services sector. Whenever the term services sector is mentioned, many think of IT services and recall companies such as Wipro or Infosys. Factually, all software-related activities come under business services, which itself accounts for less than 2 per cent of the national income. Actually, the services encompass a much larger canvas and it is also the fastest growing sector in the economy. More important, the growth in the economy during the 1990s was due to Proprietorship and Partnership firms in service activities such as construction, trade, (whole sale and retail), hotels and restaurants, non-Railway transport, real estate, business and other services. 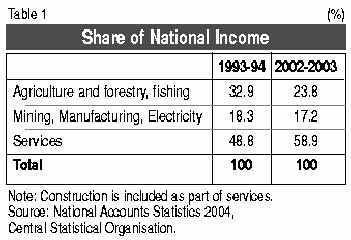 Table 1 gives the share of national income of different sectors in 1993-94 and 2001-2002. 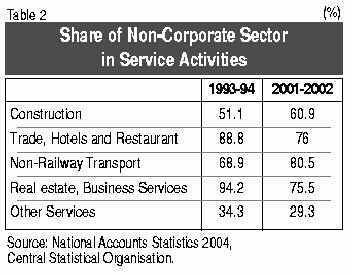 The share of service sector in the economy grew from 49 per cent to 59 per cent during 1993-94 to 2001-2002. In other words, a significant portion of the national income is due to service activities and this has substantially increased in the last ten years. Table 2 gives the share of non-corporate sector (Proprietorship and Partnership firms) in the service activities during 1993-94 and 2001-2002. The service economy is essentially P&P (Proprietorship and Partnership) economy. 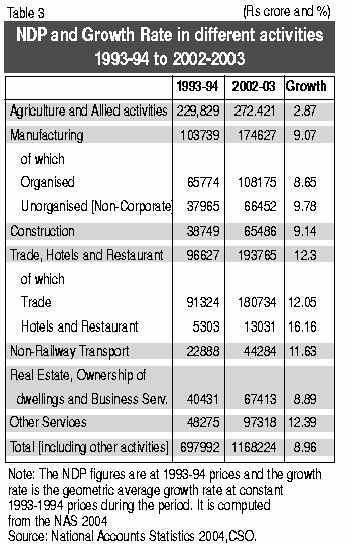 The growth rate in the service activities dominated by P&P is given in Table 3 along with that of agriculture and organised manufacturing. The service activities dominated by the P&P sector has grown much faster than that of agriculture or organised manufacturing. Actually, the phenomenal growth in construction, trade, hotels and restaurants, non-Railway transport and business services are the main reasons for the significant growth of the economy in the 1990s and later. 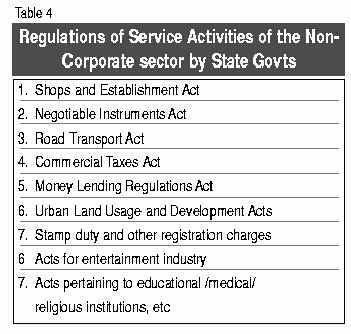 It is important to note that the service sector, where the non-corporate organisations are dominant, are regulated by rules and regulations of the State governments rather than the Centre. Except for direct and indirect taxes (income-tax and central excise), all other taxations are in the hands of the State governments. Most of the regulations pertaining to the non-corporate sector are under State governments. Some of them are listed in Table 4. 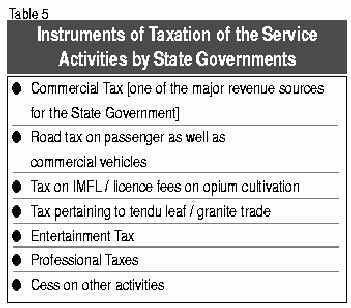 The instruments to generate taxes from the service activities of the non-corporate sector are also with the State governments. Some of these are given in Table 5. None of these Acts or Regulations or Instruments of Taxation has undergone any reforms or changes in the last 15 years. 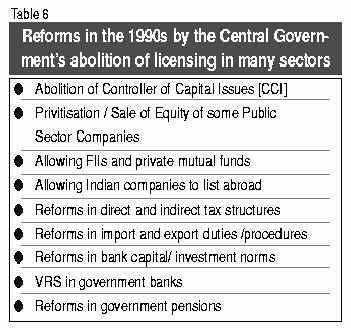 The reforms undertaken in the 1990s by the Centre primarily pertain to the government itself and the corporate sector and global companies in finance and other activities. The reforms may have helped some large corporates or global investors or some MNCs but surely not the non-corporate sector which has been the engine of growth in the last 15 years. The fact of the matter is that the savings rate of the economy has grown significantly from a low of 7.3 per cent in 1960-61 to 13.8 in 1980-81 to 21.9 in 2000-2001 and 90 per cent of this savings come from the household sector, which includes proprietorships and partnerships. The savings of the households have grown phenomenally from the 1970s to the 1990s and this has contributed to the significant growth in the economy and it is not due to but despite the Governments both at the State and the Centre. A significant part of the savings has been grabbed by the governments (Centre and States) through banks, postal schemes, providend fund, and so on, for their unproductive expenditure and the balance has been used by the household sector in the service activities where they dominate. It is ironical that experts do not want to acknowledge the extraordinary efforts of households to increase the saving rate, to pull us out of the so-called “vicious cycle” theory of poverty propounded in the 1960s by many a Western economists. That theory condemned countries such as India to eternal deprivation as it postulated that low-income economies generate low savings and, hence, low investment leading to low income.But our households proved the theory wrong. The customary wisdom of linking reforms of the Centre to the growth in the economy in the last 15 years may require a critical examination and, perhaps, a revision. There is a Tamil proverb about a crow sitting on a palm tree and the fruit falling at that point of time and how the onlookers ascribe it to the crow. Economists and other experts, in ascribing the growth of the economy in the 1990s to the reforms of the Centre and not due to the secular increase in the savings of the households, perhaps make the same mistake.